View 62 by Paco Roncero is now the hottest dining destination in Hong Kong, brought to us by the world-famous chef, Paco Roncero, who is the author of the prize-winning cookbook “Tapas y Gastronomia Siglo XXI” and gained two Michelin stars in 2009 for the restaurant, La Terraza del Casino in Madrid. Housed on the top floor of Hopewell Centre, View 62 is the only revolving restaurant in Hong Kong and will complete a 360-degree turn every 2 hours, overlooking the panoramic view of Hong Kong. 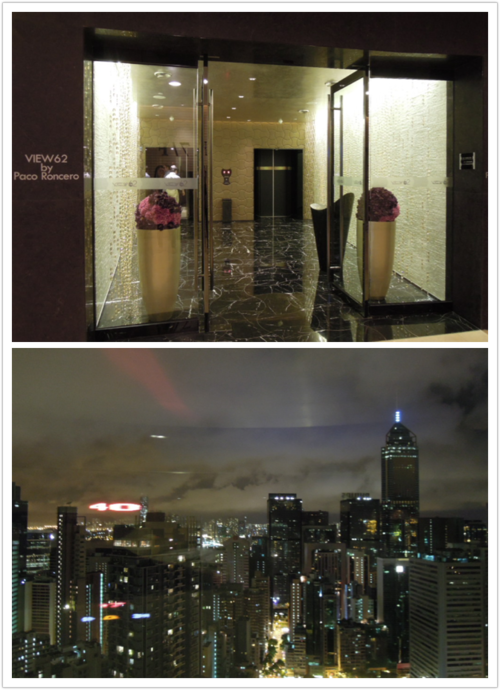 View 62 has their own elevator in Hopewell Centre, and my friends and I were thoroughly impressed by the grandeur of the view inside the lift (second photo below)! We went to the restaurant during its soft opening, so only tasting menus, ranging from $680 to $1800 per head, were available. 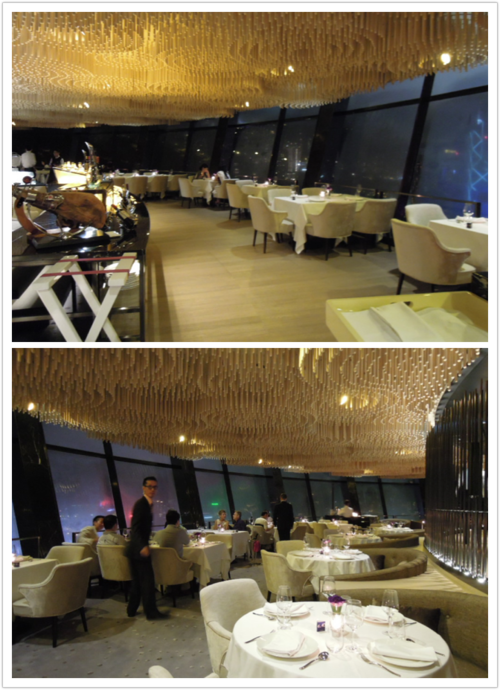 The interior of the restaurant was sophisticated and refined. 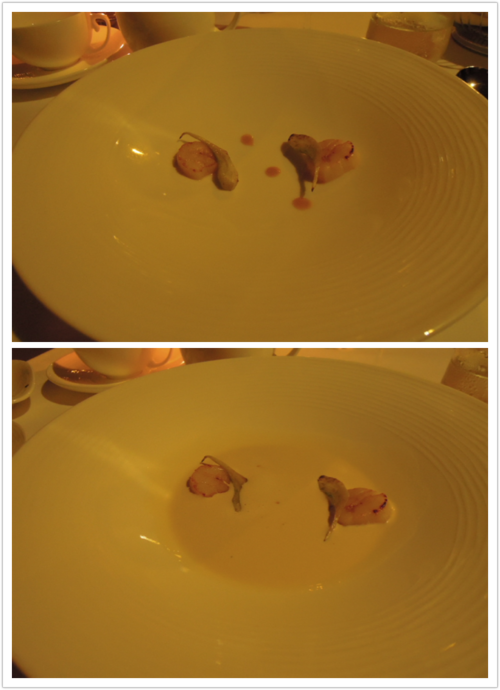 However, the quality of the food and the service of View 62 did not match its opulent settings. The Nouvelle European cuisine lacked energy, and failed to astonish us in any respect. While the waiters were friendly and enthusiastic, we could not help noticing their lack of expertise and understanding of the dishes, which seemed unbefitting for such a purportedly high-end restaurant. Similar to Felix at The Peninsular, we were given an ipad to browse the wine list, but the wine selection was inextensive and many of the wines did not have a description to them. We only found out afterwards that the restaurant is operated by the King Parrot group that normally runs average-priced restaurants such as King Ludwig Beerhall and Al Pasha, which perhaps contributes to the restaurant’s lack of finesse. 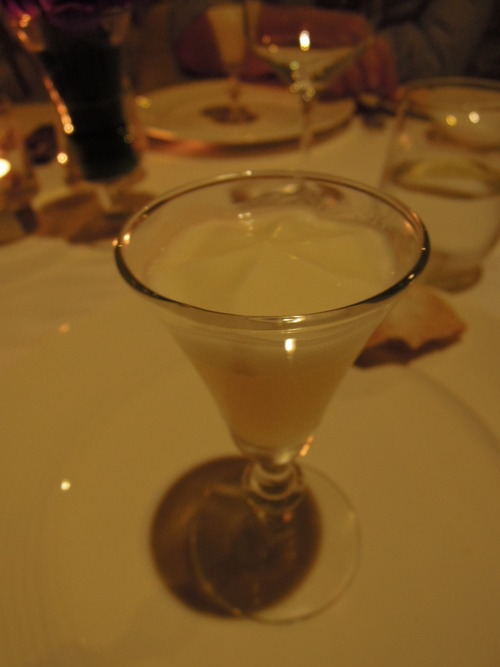 (1) For amuse bouche, we had a Frozen Gin Fizz which consisted of a frozen mixture of gin and lemon juice, topped with warm foam. The lemon juice really stood out and the drink was overall very refreshing. What was particularly commendable was the inspiring contrast between the iciness of the gin and the soothing warmth of the foam. (2) This PhiloPizza was listed on our tasting menu as a “snack”, but it was pitifully tiny, and I thought it really should have been one of the items you find in a bread basket, undeserving of its own place on the menu. It was made with oregano, Parmesan cheese and tomato powder. The flavours of the various ingredients were outstanding, but the crust was paper-thin and the snack lacked substance to it. 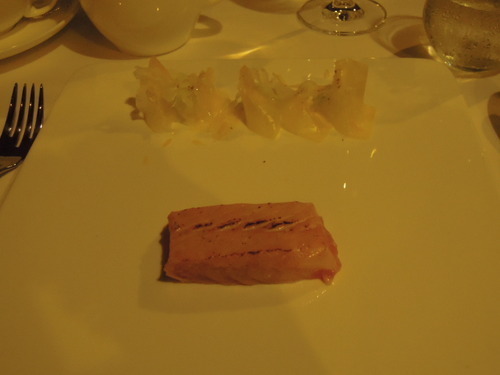 (4) For appetiser, we had a Salmon cooked at 40°C. The accompanying Cucumber and Pineapple Salad had a smokey flavour and a crisp texture, and was served nicely chilled. The salmon was smooth and adorably tender. 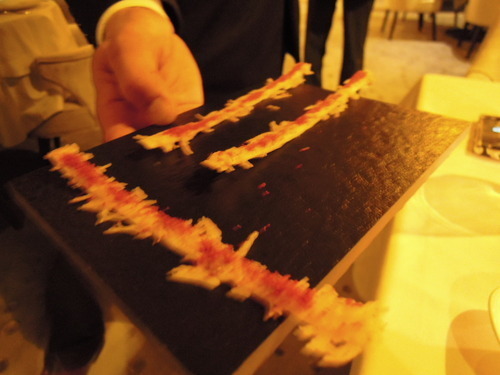 I loved the fact that the salmon was still raw inside – really, I can never seem to get enough of raw meats! My only complaint, however, was the lukewarm temperature of the fish when it was served. 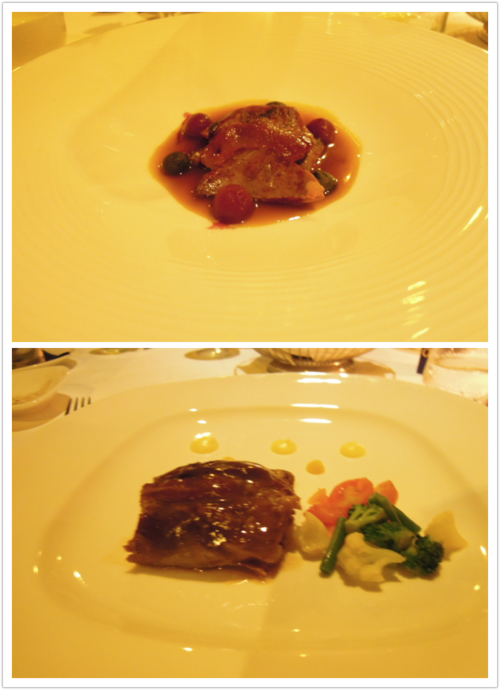 (5) All but one of us ordered the Pigeon with Truffle Puree and Apple Jelly (top) for our main course, which was exquisitely tender as well. The pigeon was cooked in a truffle puree, but the taste of the sauce was barely memorable. K, who was the only person who went for the Lamb Shoulder at Low Temperature with Lemon Puree (bottom), thought that the texture of the lamb attained perfection, but (now having become a recurring theme of this restaurant) the meat was not hot enough. Conclusion: The food, wine selection and service at View 62 could not be considered magnificent, but the view of the restaurant was truly spectacular. Even though a revolving floor is not a novel concept, my friends and I were still somewhat intrigued, and could not help childishly discussing which part of Hong Kong we were looking at (“When are we getting back to Central?”,”Oh, is that my office?”) One word of warning though: we all felt dizzy around ten minutes into the meal, and it was not alcohol-induced as we had not started drinking then. Fortunately, none of us vomited, thanks to the small portions of the dishes which left all of us feeling hungry.